Love Like This Life: Messenger Bag Giveaway! Have you guys heard of this company, 3E Love? Recently, a blog reader sent me a picture with some of their products (Hi Lena!) and I fell in love with their message. 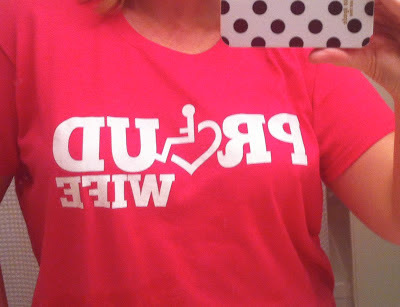 So, of course, I went online and got this T-shirt. Because if I'm anything, it's a Proud Wife! 3E Love doesn't call themselves a "company," though. Rather, they call themselves a "social entrepreneurial experiement to change the perception of disability." The company was started by brother and sister, Annie and Stevie Hopkins. Annie passed away in 2009, but Stevie has been working hard, spreading the message of 3E Love, and this beautiful symbol. "The symbol is an attitude and a lifestyle. It's accepting one's abilities and rallying around that diversity and turning it into strength. It's loving and living life to the fullest no matter who you are and what you look like, no matter what you can or cannot do." I'd like to do my part in spreading the word about 3E Love. So - how about a fun giveaway? See that super cute messenger bag up there? It can be yours! All you have to do is leave a comment on this post by Friday, November 9th at 10:00am, and I will choose a winner randomly from the comments, and I will announce the winner by 5:00pm Friday, November 9th. Messenger Bag w/ Wheelchair Heart. 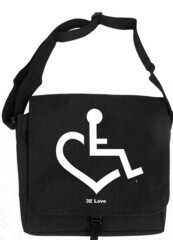 An Anvil Messenger Bag with our trademarked Wheelchair Heart symbol printed large in white ink. Get this bag in black or navy blue. Put your books in it for school, your work files for a big meeting, or even use it as a laptop bag. Dimensions: 14-1/2" x 12" x 5"
Go ahead and like 3E Love on Facebook and follow them on Twitter, so you can keep up with what they're doing, and the cool products they have to offer. I absolutely LOVE this. I would love to have one to use. The school system(s) I have worked for sometimes provide a bag to carry items in, but usually has the county on the outside, not the specialty area that I work in. (Special Education Teacher) Is there a way to order this wonderful piece of artwork??? Love this bag. I would love to win also. Will be checking out this website soon!! Love the bag and the shirt. I just might have to order one. My daughter recently told me about this company AND she has the same shirt as you except it says "proud daughter", considering she is Ben's step daughter, it makes my heart sing! I think Ill take a look and see if they have somethin I might like. I love it and will be looking at their stuff! Thanks for this fun give-away! Wow! I LOVE the Tshirt and must order one for myself!! I would LOVE to win that very cool messenger bag also!! I am a proud wife! My husband is amazing!!! Thanks for having this offer! FUN!! TrueGritLeather - Rugged handmade leather briefcases, laptop bags, messenger bags, duffle bags and purses built to last, Messenger Bags for men.